Highlights of the "40th Tokyo Motor Show 2007" Yamaha Booth and the display model, "XS-V1 Sakura" (special exhibition model / prototype) - News Releases | Yamaha Motor Co., Ltd.
Yamaha Motor Co., Ltd. is proud to announce that it will be displaying 19 exhibition models in a booth organized around the concept of "The Art of Engineering" at the upcoming 40th Tokyo Motor Show 2007 to be held over the 16 days from Oct. 27 (Sat.) to Nov. 11 (Sun.) (Organizer: Japan Automobile Manufacturers Association; Venue: Makuhari Messe, Chiba Pref. ; Special invitation day: Oct. 26). Among the world premiere models to be unveiled for the first time in the world at this Tokyo Motor Show, we introduce the special exhibition model, "XS-V1 Sakura," a model that boasts the latest technologies in its 1,000cc, air-cooled V-twin engine and chassis, while featuring a "Japanese style" look integrated with an image of the XS-1, Yamaha's first 4-stroke model (released in 1970 / 650cc). As with the 37th and 39th shows, the Yamaha booth concept for the 40th Tokyo Motor Show is "The Art of Engineering." In a more radical design than ever before, the booth seeks to express the true essence of Yamaha by presenting the entire booth as a "Yamaha Museum" and displaying models as works of art that are the realizations of Yamaha's corporate principle: to be a company that creates Kando*. In this way we hope to express the possibilities and the beauties of the motorcycle as a vehicle and the enjoyment it can bring. The "art" we wish to express is steeped in the Yamaha philosophy that the surprises, excitement and new discoveries a motorcycle can bring are not to be found merely in performance specs. And, in order to allow visitors to fully appreciate these works of "art," the booth is designed so that most of the models on display can be looked at from all angles. The booth is also designed to present the conceptual art of Yamaha motorcycle design and engineering by presenting our definitive design ideals of (1) "GENESIS," the engineering ideal that sees the engine, the chassis and the other main components of a motorcycle not as individual mechanisms but as integrated parts of a single whole, (2) the "G.E.N.I.C.H." ideal that pursues the active adoption of the latest electronic control technologies in ways that achieve ever higher levels of "rider-machine communication" based on human perceptions, and (3) "Smart Power," the concept of achieving both customer excitement and eco-friendliness with new power sources capable of creating exciting new riding experiences. We hope to also express the ideal of "Functional Beauty" in Yamaha motorcycles where performance is expressed directly in the sculpted forms of the motorcycle's components in a high-level fusion of function and beauty. Also, we display the "XS-V1 Sakura" (special exhibition model / prototype) as a symbol of our long-nurtured corporate philosophy. This is a V-twin sport model with a look of "Japanese style" in the image of Yamaha's first 4-stroke model, the XS-1 (650cc), released in 1970. Its design is full of XS-1 DNA, in its simplicity and functional beauty and finds new refinement in a retro-modern aesthetic. 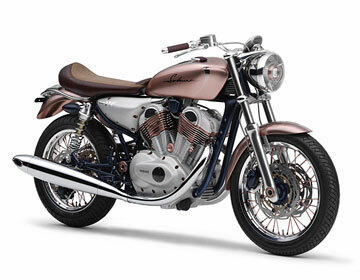 It is a model that proposes a very Yamaha and very Japanese vision of premium motorcycling life, bringing together the unique characteristics of a 1,000cc air-cooled, V-twin model with its strong pulse feeling and easy-going running performance in a finely crafted body that is lightweight and slim and defined by a low seat height. *Kando is a Japanese word for the simultaneous feeling of deep satisfaction and intense excitement that people experience when they encounter something of exceptional value.